Tokunation › Super Sentai › First Look- Kishiryu Sentai RyuSoulger Villains! First Look- Kishiryu Sentai RyuSoulger Villains! Another new image has surfaced online for the 43rd Super Sentai Series, Kishiryu Sentai RyuSoulger! This is our first proper look at the members of the series’ villains- the Druidon Tribe! According to the early story details, these monsters attacked Earth during the time of dinosaurs but fought against the KishiRyu and the Knights, finally fleeing before the great extinction. But now in modern times they have returned to finish what they started! *The heavily-armored general is named Tankjou and he commands the series’ foot soldiers- known as Dorun Soldiers. 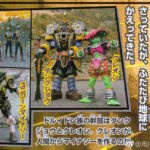 *The smaller green general is known as Creon and has the power to create monsters (known in-series as Mynasaurs to battle the RyuSoulgers. Keep in mind, official English spellings for these names have not been confirmed at time of writing. 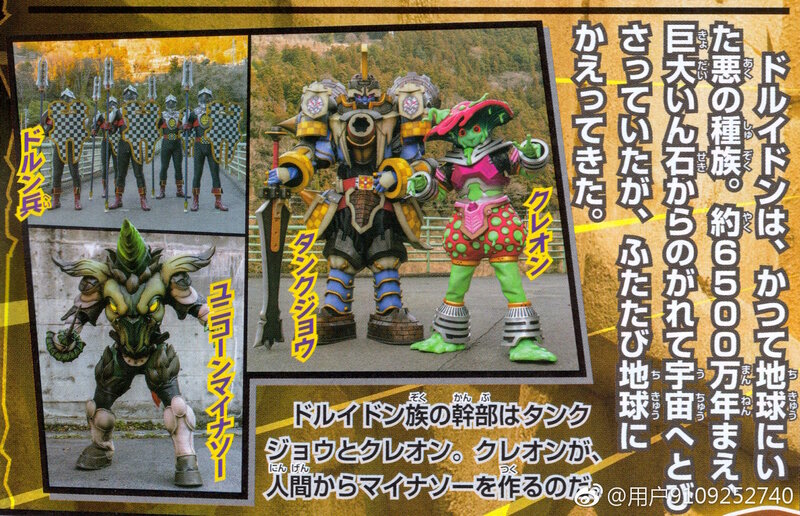 The Druidon’s battle with the RyuSoulgers officially starts March 17 2019! Feel free to join in our Ongoing RyuSoulger Rumor Thread to share your thoughts & fears about this remarkable new Sentai series!